A year in the life of high school senior Christine "Lady Bird" McPherson, who was born and raised in Sacramento, CA, but longs to move to the east coast, preferably New York City. This is much to the chagrin of her mother, who is constantly at odds with Lady Bird. 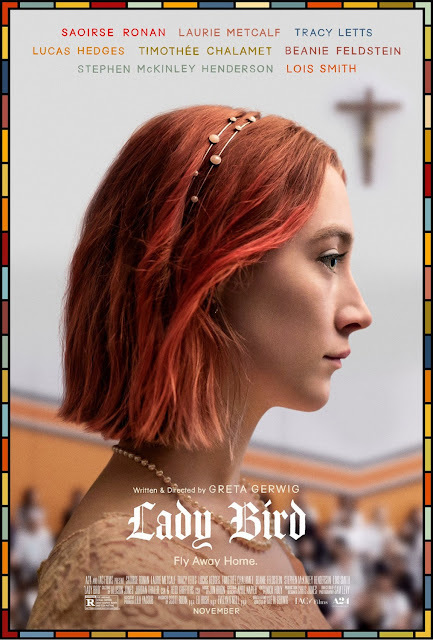 Like many independent films, "Lady Bird" is a slice of life, coming of age character sketch that covers a year in the life of a high school senior in 2003. This is the first film directed by Greta Gerwig and is every bit as quirky as Gerwig and her past performances. The movie has a semi-autobiographical feel to it as it would appear the story is heavily inspired by Gerwig's own life given that she grew up in Sacramento. It stars Saoirse Ronan as the titular Christine "Lady Bird" McPherson, a high school senior who laments growing up in boring ol' Sacramento and longs for the culture of the east coast, primarily New York City... or at least New Hampshire or Connecticut. She makes everyone call her Lady Bird because it's a name given to herself by herself. She has a loving yet contentious relationship with her mother Marion, played by Laurie Metcalf, who works hard to provide for her family but seems constantly angry with Lady Bird's lack of appreciation for what she has in life. Lady Bird goes to a private Catholic school surrounded by rich kids and resents that her family is middle class. She does typical high school activities like hanging out with her best friend Julie, played by Beanie Feldstein, dating boys, finding work, applying to colleges, and trying new things in order to find her place in this crazy world. The one thing we can say about "Lady Bird" right off the bat is it is one of the most honest and sincere films of 2017. The acting is phenomenal, especially from Saoirse Ronan and Laurie Metcalf. As mother and daughter, the two of them have many tender moments of undying love and a few heated exchanges that feel very realistic, like the fights you may have had with your very own mother. As Lady Bird experiences growing pains and longs for something different over the span of her senior year, her mother is equal parts scared, heartbroken, and angry with her choices. Metcalf is fantastic as a tough but concerned mother, and Ronan is wonderful as her self-absorbed, blossoming, vulnerable and stubborn daughter. Lady Bird also has many other people in her life, including her down on his luck father Larry, played by Tracy Letts, her first boyfriend Danny, played by Lucas Hedges, and her second boyfriend, the "down with the system" Kyle, played by Timothée Chalamet. These three individuals all offer some great performances. Look out for Hedges and Chalamet, they will most certainly be around for a long while. Excellent performances and relatability aside, one cannot deny that "Lady Bird" is a fairly formulaic coming of age story. It hits the same notes a dozen other films have hit when it comes to detailing relationships with parents, feuds with friends, finding boyfriends, and discovering one's true self. How much you like this film may have to do with how well you identify with the characters. If you've gone through anything even remotely close to what Lady Bird has gone through, chances are, it will click for you. I was personally quite moved by the film. I saw a lot of my own life playing out on the big screen as if this movie had been hijacked from my diary and written about my own personal experiences. BigJ, on the other hand, didn't get as emotionally invested in the characters as he would have liked. He didn't have much to relate to in terms of the story. It fell way short of his expectations considering the hype-train that has been out there singing this movie's praises. With a relatable, funny, and honest emotional punch, terrific performances, and a killer (an accurate!) soundtrack, we think "Lady Bird" will resonate with many moviegoers and critics alike. Whether you're an adolescent attempting to chase your dreams or a parent who has had to let go of their child, there's something for everyone in this quirky, charming film.